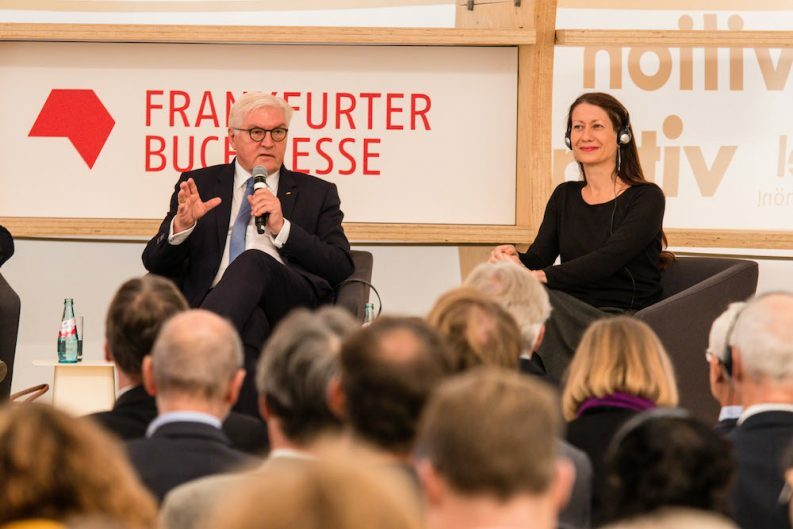 The Federal President of Germany, Frank-Walter Steinmeier, visited the Frankfurt Book Fair and spoke with authors on stage about democracy and freedom of speech. The current state of society and democracy was the topic of a discussion at the Frankfurt Pavilion, a new, iconic event venue at the book fair with the Federal President of Germany, Frank-Walter Steinmeier; the Croatian author Ivana Sajko, the recipient of this year’s International Literature Award from the Haus der Kulturen der Welt; and Belgian writer Stefan Hertmans. Under the title “On Opining. How to Defend Freedom in Turbulent Times” the three participants discussed “How to Defend Freedom in Turbulent Times,” while populism and extreme views stoke fears. People are worried about the position of democracy in modern societies, said the director of the book fair Juergen Boos at the beginning in his introduction remarks. The fair cannot give definite answers, but it can ask questions, he said. Nevertheless, the Federal President and his guests tried to find answers as well. Steinmeier pointed out that the Universal Declaration of Human Rights as a reaction to the atrocities of World War II should be used as a standard around which countries should orient themselves. “We need it as a basis of intervention”, he said, knowing that the human rights are not respected by everyone and every country. Steinmeier mentioned the hundreds of journalists and authors all over the world who have been murdered or sent to prison. Stefan Hertmans pointed out that literature is an exercise in empathizing with other people. He thinks that certain places in Europe are a kind of laboratory for how people of different nationalities live together. He said we live in a time of mixed identities, the longing for fixed identities he called “a kind of disease.” The question remains: “How can we be more relaxed about different identities? And how can we explain that to the people at the bottom of society?” For Hertmans, it is a social problem. “We need to find a language,” he appealed. Only through practice, not theory, can we find out how Europe should be, he said. This is something Steinmeier agreed with. He said at the end, you cannot prescribe ideals. But we all should live and practice it so that change will happen.